The Jewish community of Ancona dates back to around 1300. In 1427 the Franciscan frairs tryed to force the Jews of Ancona to wear the Jewish badge and to live in a single street, but apparently this attempt was unsuccessful. After the expulsion of the Jews from the Spanish dominions of 1492 refugees began to arrive in Ancona, to be joined later by others from the Kingdom of Naples. As Ancona was about to be declared a free port, Pope Paul III invited merchants from the Levant to settle in Ancona regardless of their religion. Promising protection against the Inquisition he encouraged the settlement of Jews and crypto-Jews. Thus many Jewish merchants took advantage of the harbor facilities and settled in town to trade with the Levant. In Ancona settled about one hundred Portuguese crypto-Jewish families. The event moved Dona Gracia Nasi a rich merchant woman to organize a boycott of the port of Ancona: the first attempt by Jewry to utilize economic power as a weapon against persecutors. When in 1569 the Pope expelled the Jews, Ancona and Rome where the only towns where they could reside. Nevertheless many decided to leave. A local Purim was observed on Tevet 21 to commemorate the deliverance of the community from an earthquake that occurred on December 29, 1690. As late as 1775 Pope Pius VI again enforced all the most extreme anti-Jewish legislation. During the occupation by the French army in 1797 most humiliating provisions were abrogated: the gates of the ghetto were removed, and three Jews, Samson Costantini, and David and Ezekiel Morpurgo, sat on the new municipal council. In 1814, after Napoleon's downfall, Ancona reverted to the Papal States, and the former legislation was reintroduced. The Jews obtained complete civic rights in 1861when Ancona was included in the Kingdom of Italy. The size of the community and its widespread connections attracted many noted rabbis and scholars throughout the centuries, including the Humanist Judah Messer Leon (15th century), the physician Amatus Lusitanus, and Moses Basola (16th century), Mahalalel Hallelyja of Civitanova, Hezekiah Manoach Provenzal, Joseph Fermi (17th century), Samson Morpurgo, Joseph Fiammetta (18th century), Jacob Shabbetai Sinigaglia, Isaiah Raphael Azulai, David Abraham Vivanti, Isaac Raphael Tedeschi (19th century), and H. Rosenberg who published several monographs on local history. During World War II, persecutions were more individual than collective in character. The Germans and eventually the Italian Fascists demanded tributes to allow the Jews to live. After the war 400 Jews were left in town, and the number dropped to 300 in 1969. There are two synagogues and a Mikveh in Ancona, and there are two Jewish cemeteries: Monte Cardeto, the old one, and Tavernelle, the new cemetery. Most immigrants were Marranos and Levantines, thus Ancona is a center of cultural and commercial relations throughout the Mediterranean. 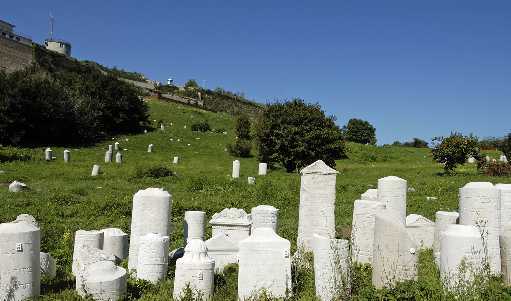 The Jewish cemetery of Ancona is situated in a very panoramic position on the sea. With its 15.000 sqmt is one of the largest and fascinating of Europe. The first document concerning the Jewish cemetery is an act of 1428 in which the municipality of Ancona gives a piece of land to the Jewish community for the cemetery. The cemetery was enlarged in 1462 and in 1711. There are 1058 stones more then 700 in their original position. Only three-hundreds have been cathalogued. The oldest stone is of the year 1552 and belongs to Ishai Pinto. - Jewish Cemeteries. Please contact for information. - Viviana Bonazzoli, Commerciare dal ghetto : la società Oef-Magistri in Ancona a metà '600. - Ancona : Archivio di Stato, 2000..
- Max Radin, A Charter of Privileges of the Jews in Ancona of the Year 1535, The Jewish Quarterly Review, New Ser., Vol. 4, No. 2 (Oct., 1913), pp. 225-248.